There is no better reminder of the urban setting in which our bees are foraging than a certain spot on the trail across the river from our home. As you rise up a forested hill, you come to a clearing. And now, in the Fall, the clearing is full of late season wildflowers. Aster and goldenrod mostly, but many other flowering plants. And if you look closely, the flowers are covered in bees. It is not a quiet place. The highway runs through the center of the meadow. And a factory's smoke stack is visible behind it. Planes swoosh past low and overhead from time to time. There is graffiti on the overpass. Bits of garbage thrown from cars up above litter the ground closer to the road. A natural gas pipeline passes underneath. It is, perfectly, and quite beautifully, urban wild. The meadow only exists due to the placement of the highway. And without construction and road maintenance, it would quickly grow back and return to a young growth version of the woods it once was. But it is cleared from time to time. And the larger shade creating plants are mown. And therefore wildflowers rule. And this meadow is filled, at this time of year, with bees of every variety. Including honeybees. And given its proximity to our house, it is likely that many of the bees here are my honeybees. Urban beekeeping. It is unique. And the terrain the bees forage has an element of urban grunge. There is something about watching your bees forage next to wizzing by cars that makes you feel a little sad for them. Admittedly, maybe this is only me. But there are benefits to this kind of terrain for the bees, such as lack of widespread pesticides they might come upon in more rural agricultural areas. And there is such a reality-based and strong message that can be sent and seen by showing how this is our world, and this is the nature here between our feet, and looking at how nature can coexist with the presence and effects of humans. Thinking on all this, I headed home and took a look at our hives to see how they were handling the mite treatments, a health management issue for all beekeepers these days. 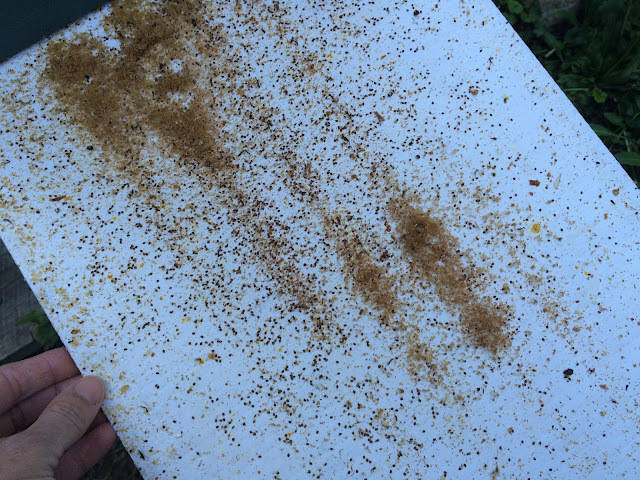 I pulled out the inspection boards in the bottoms of both hives. They were very messy and covered in debris. The lighter shavings among the debris are bits of the paper strips into which the treatment had been soaked. The bees are shredding it and removing it from their hive. Tidying the place up before winter. 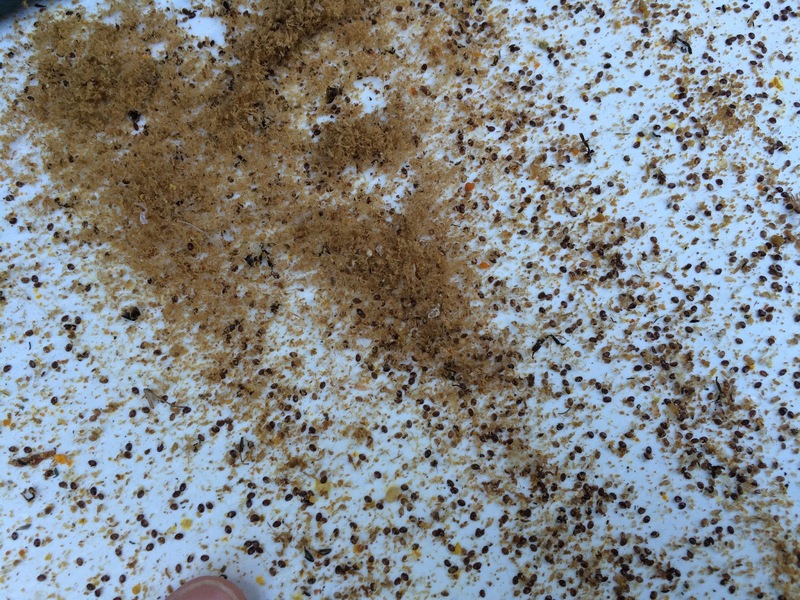 And the dark reddish seed looking specks, those are mites. Dead mites. 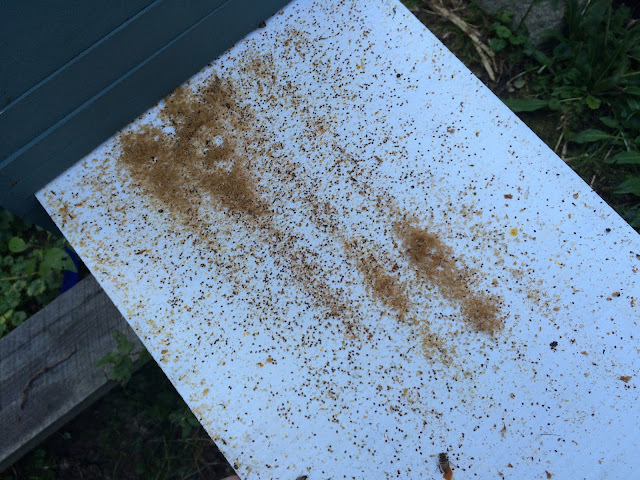 Mites killed and therefore no longer draining my bees heading into winter. So many of them. So messy and kind of yucky. And yet, so good for the bees, and therefore, so beautiful. I am not a fan of cities but I do love those unique oases of wildlife that you find only in urban areas. They are as special as those found anywhere else.